Facebook is at it again. ATTENTION FANS: As you may have heard, Facebook has made many changes to fan pages recently, including requiring us to pay if we want our updates to be seen by our followers. If we don’t pay to promote our posts, only about 10% of you will receive them in your news feed. If you’d like to continue to enjoy our updates through Facebook, make sure to add us to your “Interest List”. Simply hover over the wheel next to the Like button on our page and select “Add to Interest Lists”. Start a list for your favorite pages, and when you click on that list you will see all of our updates! You’ve likely seen the above copy and paste recently from a brand you Like on Facebook. Or maybe you’ve even shared it. Please, don’t do it. Especially not the first paragraph. It comes off as whiny and it’s filled with holes. If you’re copying and pasting what other brands are copying and pasting, your efforts are going to be counterproductive. Instead of getting added to an Interest List, you may just be hidden or unliked instead. Why, you ask? You may want to sit down when you read this. I know, I know. You care. Your content is amazing. No one should ever miss a single post of yours, whether they’re online or not. And maybe you even stalk all 150 Pages that you Like, looking for another amazing marketing message to comment on or give a thumbs up. But here’s the thing: You’re the edge case. As a Page admin, you do not represent the typical user. Of those 284 brands, how many do I really want to hear from today? Maybe five or 10. I don’t care if I hear from any others. No matter how exciting and interesting you make your brand, you’re still a brand. You’re not my friend. I’m fine seeing some of your stuff. In some cases, I want to see that stuff. But it’s not the main reason I’m on Facebook. But brands don’t get this. 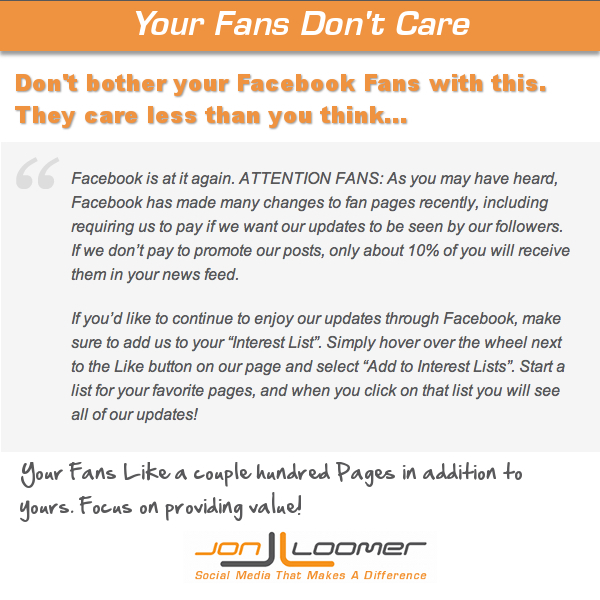 They assume that everyone Likes their Page because they can’t wait to hear from them. They assume that Fans who find out they aren’t seeing ALL of this brand’s content will be outraged. Some care. Some are neutral. And most don’t care at all. Help! Mean Facebook won’t allow me to pelt you with marketing messages! I need you to buy more stuff! Then What Good Is Facebook??!! Look, outside of the Super Bowl, no one actually wants to watch TV commercials. But they still work. Only 20% of marketing emails are ever opened. But they still work. If you think that every person you have the potential of reaching should be reached and is a brand advocate, you need to shift your expectations. Facebook works because you are intertwining your helpful messages with the messages of friends. Your Fans don’t see all of them. Sometimes they aren’t online. Sometimes they don’t see them because they are buried under other messages. Sometimes Facebook thinks that a best friend’s status update is more important than your Page sharing a blog post (whatever!). But they still see some. Just like that commercial or email, it works. Only a small percentage will become a customer. But because you portray your brand in a positive light, because you’re interesting and because you’re helpful, some of those people are more likely to eventually buy from you. As you can see, the amount of Fans I’m reaching continues to trend upwards (note: This doesn’t include Promoted Posts). I’m not only reaching Fans, but I’m getting more engagement. Well, first of all, an issue that most people seem to ignore stems from Viral Reach. That is the source of any drop in Reach that I’ve seen. Viral Reach has close to nothing to do with reaching Fans, and it hasn’t led to a drop in engagement for my Page. So before you freak out about how Facebook is harming you, make sure you know what you’re talking about first. Far too many people are talking before thinking. Use my Facebook Insights Helper to isolate exactly what is going on with your Page. You should also use Insights to determine what works and what doesn’t. Figure out what day and time your Fans engage with your content most. Determine if there’s a specific type of content that they like. But you shouldn’t only rely on stats. Ask your Fans what they like and what they want. You can even lean more on user generated content to get them involved. And finally, your first goal should be to help. This may eventually lead to business, but you can’t focus too much on the hard sell. In fact, it should be a very small part of your content. If you sell more than you help, don’t expect EdgeRank to be in your favor. I try to write as much helpful and valuable content as I can. But I get it. I get that I won’t reach more than 20% of my Fans with a single post. I get that they aren’t all online when I share. I get that Facebook may favor the content of a friend over my content. Why? Because I get that reading my content is not the main reason they are on Facebook. My Page is one of possibly hundreds that they Like. So, no, I’m not furious that I can’t reach everyone with every post. If I were a Fan of my Page, I would not want to read every single thing that I write. Or to put it differently, I would not care if I missed some or most of it. We need to change that expectation. Do not expect to reach everyone. Do not expect that everyone cares to be reached. Focus on providing value and generating engagement with those you do reach. Save the copying and pasting for someone else. 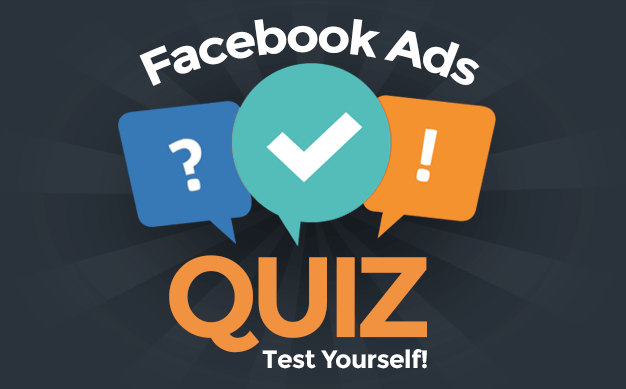 Need help with your Facebook Page? I can provide a thorough review of your Facebook efforts. Go here to learn more.